Clean off your items to be aged. 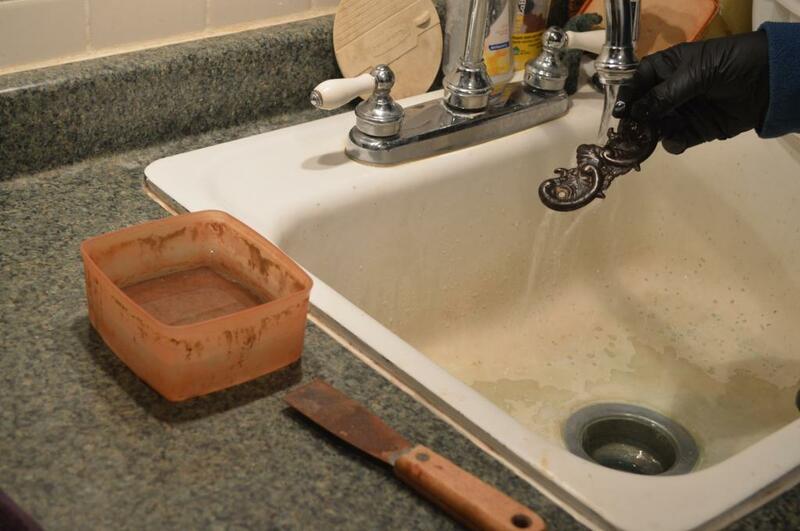 Try to remove all residue oils, dirt or collected grim. 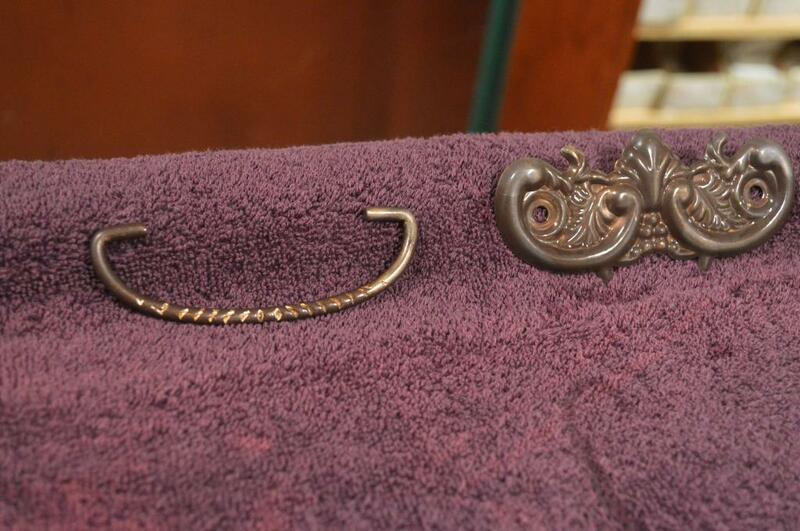 Pieces cannot have a finish coating prior to tarnishing. 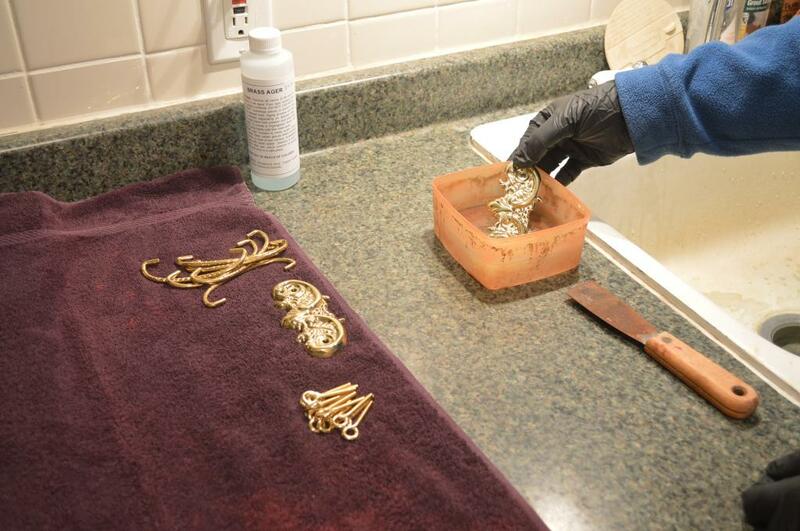 Put on your gloves, then pour the tarnish solution into your Glass or Plastic container, just enough to fully submerge your pieces in the solution. 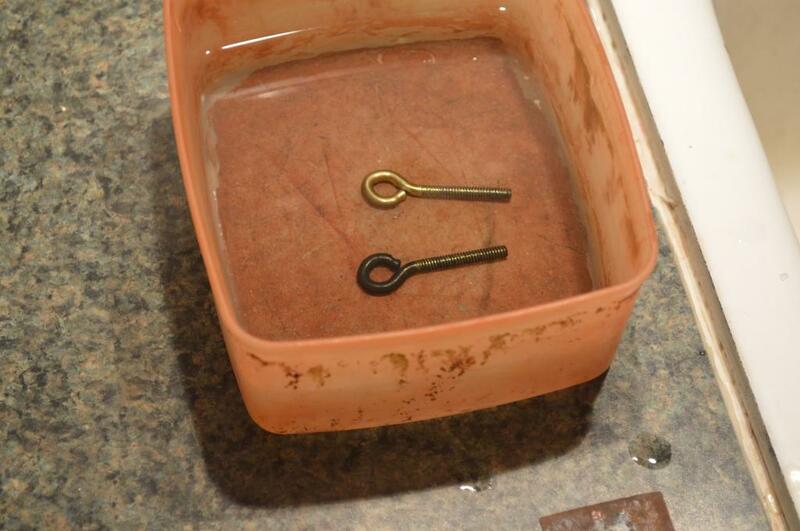 Dip your hardware into the solution so that they lay flat and are fully submerged. Only do one initially to learn how long you need to leave it in the solution to gain the desired shading. Monitor closely, they can sometimes tarnish very quickly! 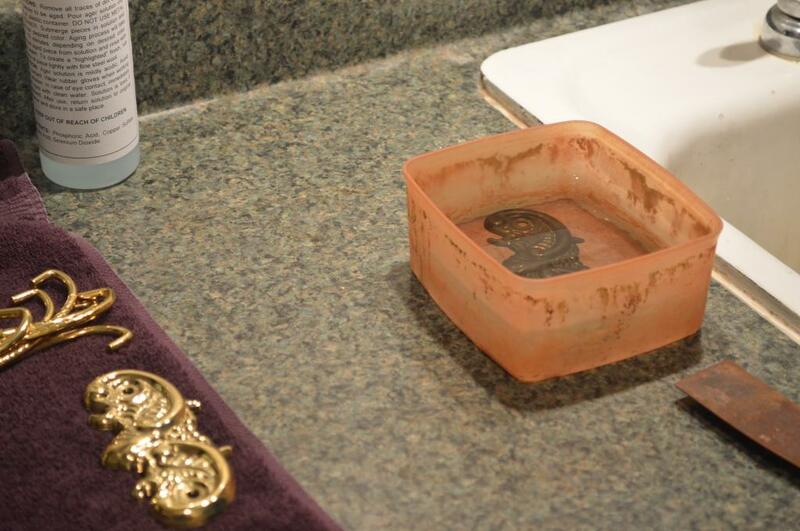 Keep an untarnished piece nearby for comparison. Once desired level is achieved, use your putty knife (or other convenient tool) to scoop under the hardware and lift an edge up enough to grab with your gloved fingers. 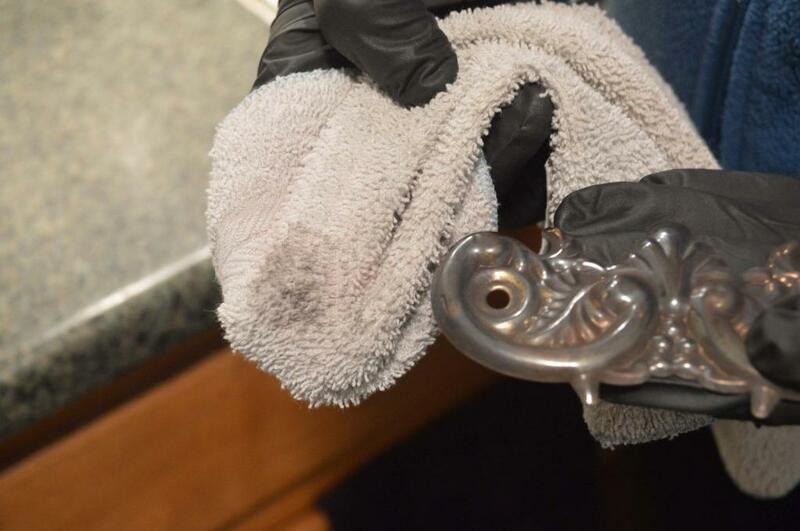 To fully remove from tarnishing solution, run the now tarnished hardware under running water for several seconds to stop the tarnishing process. 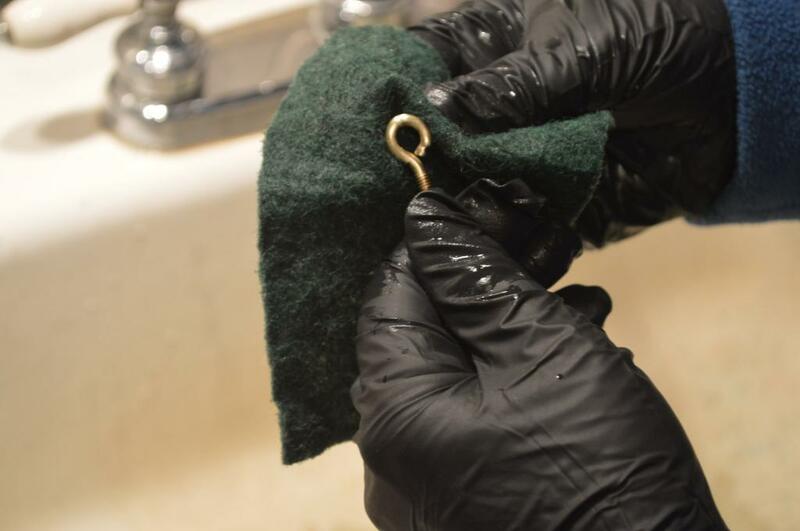 Set the piece upright on a towel to dry for at least an hour. After the piece has fully dried it might take on a ‘cloudy’ effect, but fear not! There is a solution. First try rubbing the hardware with a towel or rag, wiping off the residue left from the tarnishing process. If you are satisfied with this end result: you’re done! Repeat this process on the rest of your hardware to match. 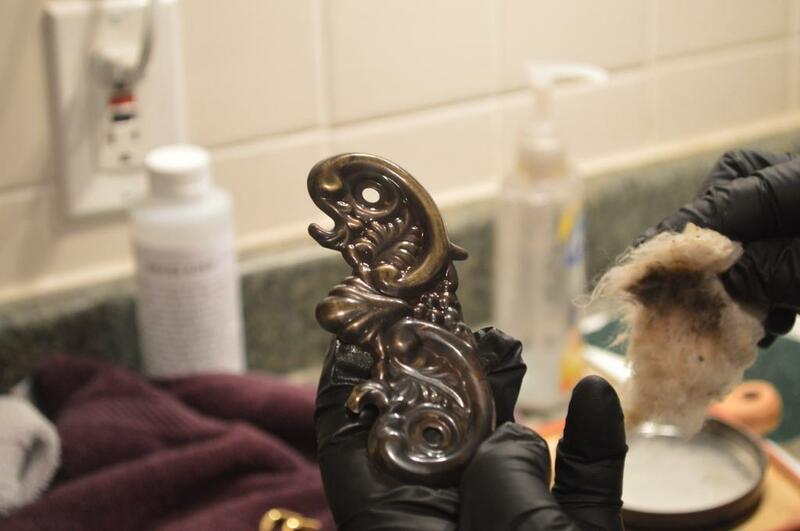 If you would like to add an antique effect, or if your hardware turned too dark, you can use a polishing compound (We recommend using Never Dull) to add highlights to your hardware, or brighten the entirety of the piece. If you’re using Never Dull, tear off a small piece of the cotton and lightly wipe the raised surfaces, removing some of the tarnish but leaving most in the crevices. Trouble shooting: Here are several things to keep in mind while tarnishing, and what to do if your experience does not turn out correctly. We sell two tarnishes, Brass tarnish and Nickel tarnish. 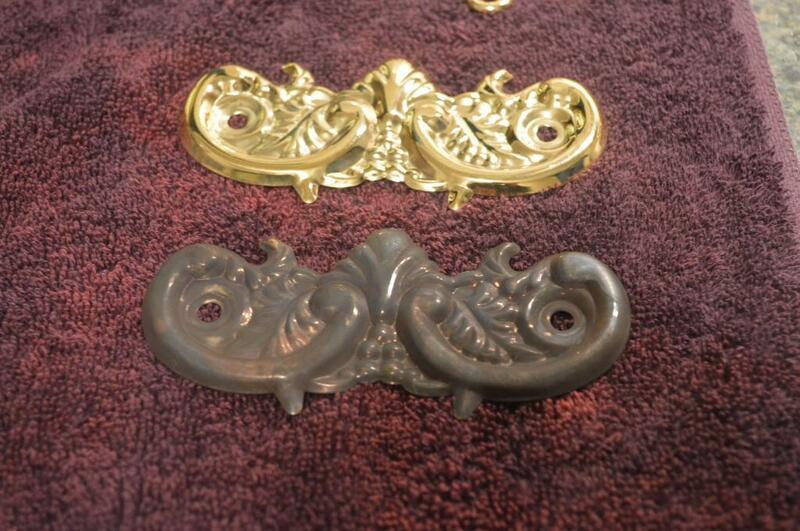 The Brass tarnish will only work on Solid Brass, not Plated Brass. 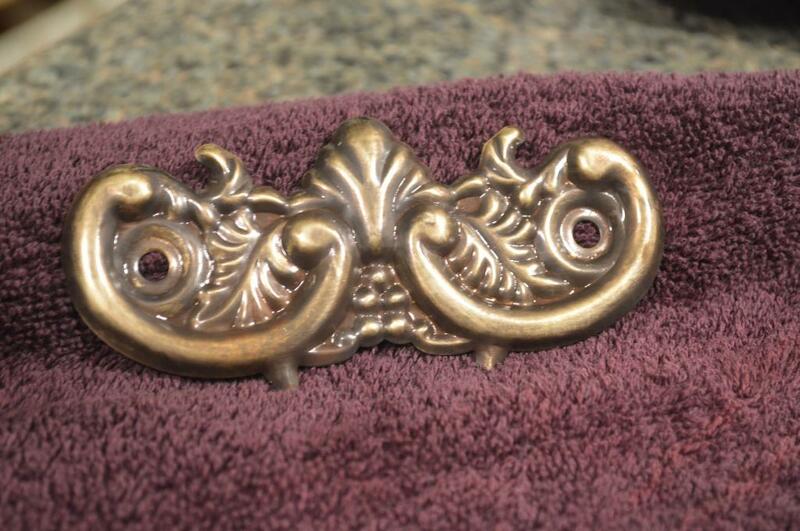 If your hardware is brass plated (not solid brass), only the Nickel Tarnish will work. After you have put a piece in the solution, you should see it starting to darken within 10-15 seconds. If there is no change (and you are using the correct tarnisher), then the problem is probably that there is a lacquer finish present. 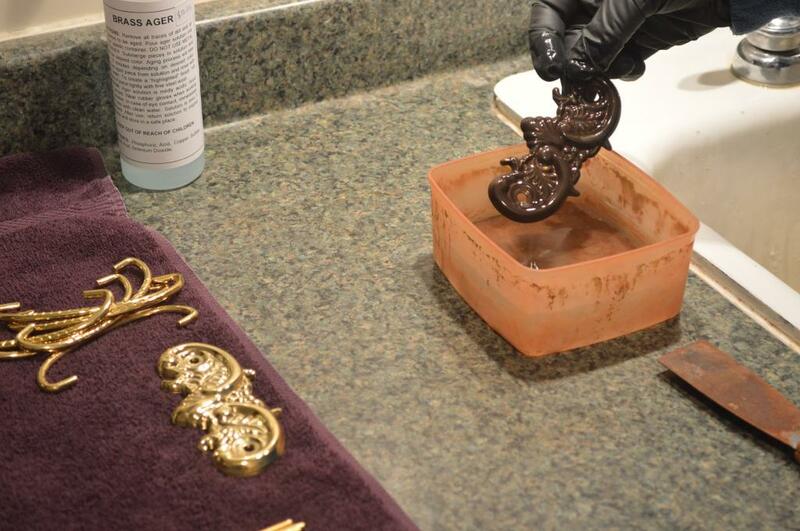 You will need to strip the lacquer off in order for the Aging Solution to work. The first thing to try would be taking an abrasive pad, and lightly scrub at the areas that are not darkening in order to remove any residue polish or a light finish. 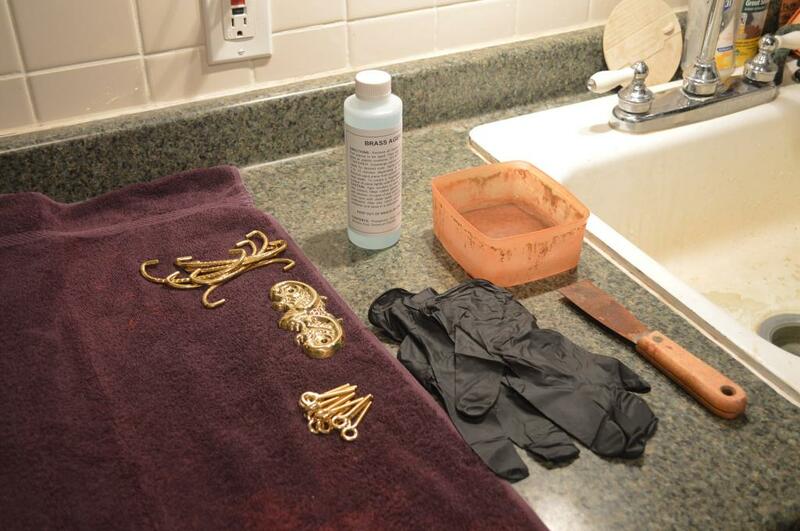 Then place the hardware back into the tarnishing solution to see if there is any change. In the event that scrubbing does not work, then you'll have to remove the finish. To strip the lacquer off you can soak the hardware over night in lacquer thinner. If this does not work then you will have to use a paint stripper. After stripping the lacquer off the hardware, repeat the tarnishing instructions.